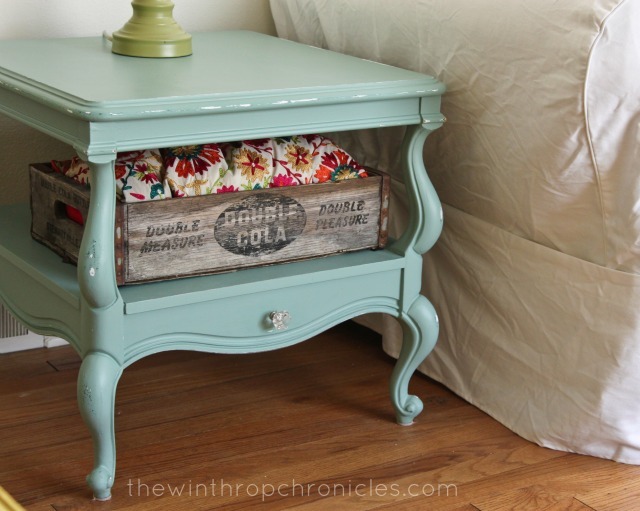 I am sure you have seen a lot of projects done with chalk paint these days... I kind of wanted to try it out... to see what the big deal was. I thought my white end tables were the perfect test subjects. After getting a white sofa cover, the white tables needed a change. I applied two coats to the tables. Then distressed the table a little. You can easily double or triple the recipe if you are painting a larger surface. The chalk paint covers well so you don't need a lot of coats. If the paint appears too thick, add more water, if it is too runny, add more plaster of paris. I like how the tables turned out... I think the difference with chalk paint is that it creates such a nice matte finish. Not as muted as flat paint, there is still a tiny bit of sheen in it. And it covers so nicely that it looks so even... well, except for the fact that I distressed it :) So I would say give it a try if you are up for a little paint project.